Recently, I was asked this question: Why is the book of Romans important for the church today and for you personally? I know where the question came from as I’ve taught verse by verse through Romans at least four times, and I’ve written extensively on themes from Romans. It has been a defining book for me. There are many answers I could give as to why the book has been so defining for me and for the church. Historically, Romans has been used of God to spark the Protestant Reformation and encourage missions and evangelism. Also, Romans 1 is the foundation for Christian apologetics, one of our key themes here at Ligonier. Romans also addresses nearly every issue of practical Christian living and proclaims clearly the doctrines of grace. But the most important reason why Christians need to be deeply grounded in the content of Romans is that the epistle gives us the most comprehensive exposition of biblical theology anywhere in Scripture. It provides the deepest and broadest teaching on the essence of the gospel—what it is and how its benefits are appropriated to the individual. We long to see people everywhere transformed by Romans and the gospel therein. 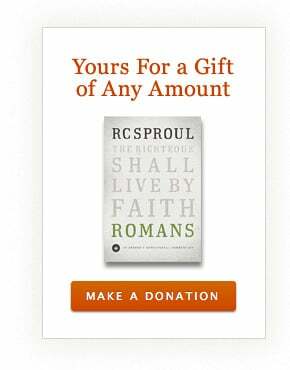 Thus, we have a special offer for you: For a gift of any amount, we will send you a copy of my expositional commentary on Romans. With each page, I can hear Dr. Sproul thundering from the pulpit: “The righteous shall live by faith!” R.C. teaches with such clarity that the reader is made to feel as if he were seated in Saint Andrew’s Chapel and experiencing the exposition first-hand. This work is sanctifying, timeless, and counted among my most treasured volumes. This is humbling and encouraging. Ligonier Ministries exists to preach the world-changing gospel of God. This gospel is our only hope, and we want to help people grow in their faith. But we need friends like you to stand with us to accomplish our mission. Can you help us this month? Thank you. Offer expires 12/31/12. Please allow up to 6 weeks for delivery after your gift is processed. Contributions are tax-deductible as allowed by law. For federal income tax purposes, the deductible portion of your charitable contribution is limited to the excess of the money contributed over the value of the goods provided. Our good faith estimate of the value of this resource is $33. Offer valid in U.S. and Canada only. Thank you for your support.